The view was taken from Albany Road, looking along Mafeking Avenue towards Brook Road. Kay Day adds the milkman was called Amos and that by 1946 he had a horse (Molly) and cart for his round. 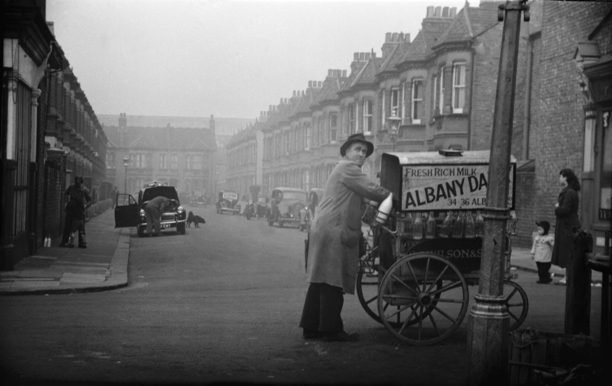 The milk cart has the name 'Wilson & Son' and address 34-36 Albany Road, the Albany Dairy, which provided 'Fresh rich milk'. Andy Dawes (August 2010): I was pleased to see the photograph of 'Amos the Milkman'. I remember Amos visiting my grandparents at 306, to me then he was Uncle Amos and was a friend of my father and grandparents.He lived in Albany Road opposite the diary,as I remember being taken around to his home by my parents or grandparents on a few occasions,this would have been post 1954. John Tickner (March 2011): He was always Uncle Amos to me, but he was actually my father's cousin. His name was Amos Charles Cox. I am surprised that it says he lived in Albany Road; from my earliest memories (mid fifties) he always lived at 26 Clifden Road. The photo cannot be early forties, as he was serving in the far east (India mostly I think) throughout the war. I believe he was actually personal assistant to one of the big generals; a whole team from Whitehall descended on Brentford to thoroughly check his credentials before he got that post. At the end of the war someone he met in India wanted him to go to Ceylon to manage a tea plantation for him, but Amos turned down the opportunity as he had promised the dairy he would return when the war was over. Which he did, and carried on working for them until retiring (1973?). When he retired he had been the milkman to the football club for over 50 years (war excepted), Denis Pigott at the club wanted to give Amos a free pass to games for life, but he was too proud to accept it! I have no idea about the history of betting shops, and the legality or otherwise of them, but I remember Amos saying he used to collect all the betting slips from the old ladies on his round on a Saturday, and go into the back of some premises somewhere to place the bets for them. One day he walked in and the place was being raided by the police, so he just handed over their milk and walked out again. He was sure, though, that the police knew just what was going on, and turned a blind eye. I don't know when they made that move round to Clifden Road, but it must have been by the mid fifties latest, though I would have thought earlier. I remember Amos telling me that one of the neighbours had made it clear they thought the Cox family were not good enough for Clifden Road, so the day they moved in they walked up and down outside this other house beating sticks on dustbin lids. They then introduced themselves and said 'You will get no further bother from us now' and they didn't. This story implies to me that he was only a youngster? (He was born 1908; there were quite a few in the family, but they were decimated by TB at an early age; there was one brother, George, who survived, and married - Amos never did - but I never knew much about him. I believe he lived in Fulham). Amos was very active with the local Oddfellows and their eventual decline was a big disappointment to him. I hope this might be of interest if anyone about still remembers Amos. John suggests the photo may date from shortly after WW2: 'that cart looks rather small and inappropriate. I don't see how he could have done his round from that. I think my earliest recollection was of one of those battery operated carts that you worked from a long handle at the front and led along behind you. I was under the impression that that machine had superceded the horse'. Dave Padbury (October 2011): his dairy was opposite the Albany pub and his horse was stabled in the Griffin pub yard. A search of telephone directories on the ancestry.co.uk website shows S.J.Wilson & Son, Dairymen, traded from 34 Albany Road in 1931 (telephone EALing 0611). The same entry (different phone no.!) appears in a 1973 directory. Searches for A Cox, Amos Cox and A C Cox were unsuccessful. Amos appears to have died in 1992 (Hounslow Registration District) and was born in late 1908. In the 1911 census he was a 2 year old son 'Amos Charlie' of Frederick and Alice Caroline Cox at 36 Albany Road, Brentford. They had been married 10 years and had 6 children. Frederick was a dock labourer for Candl (or should it be 'C and L'? ) Carriers and the family had moved into Brentford in the last few years - Amos's elder brother (age 5) was born in Fulham. The London Gazette archives include a notice in 1983, following the death of Laura Pearce, a widow of Sibbertoft, Leicestershire, formerly of 32 Greet Road Brentford. Amos Charles Cox was her personal representative.